Sustainability and environmental protection is a very important issue these days not only in our FM industry but also in our society as a whole. It is a hot topic to learn and improve upon, especially for our new FM generations. 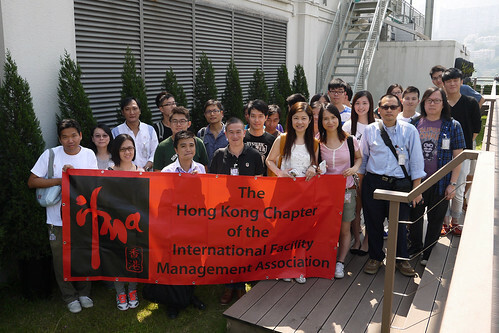 The first “Student event” was held in the “Our Green Place” at the Hong Kong Jockey Club Headquarters on October 05, 2013. The Hong Kong Jockey Club has been honored in the new Skyrise Greenery Awards for turning the rooftop of its headquarters at Happy Valley into “Our Green Place” – a delightful green oasis in the heart of the City. The project received a Silver Award in the Non-Government Organization/Institution Projects category organized by the Government’s Development Bureau in May of 2011. "Our Green Place" is a 510 square-metre roof garden on the HKJC’s headquarters building. It is full of environmental elements. Its extensive use of plants not only transforms the roof into a bright and green area, but also creates a cooling effect. A number of environmental-friendly technologies have also been adopted. This in turn enables the Club to increase its energy efficiency, reduce carbon emissions and reduce energy costs. A big thanks go to Ir Eric Lau, Technical Services Manager (HKJC) , Vice Chairman (HKAEE) for providing us with a comprehensive and interesting presentation for the visit. Also thanks go to Mr. Graham Tier, Head of Property and Facilities Management (HKJC) who sponsored and made the event possible. Besides going to “Our Green Place”, we also visited the Racing Museum at Happy Valley Racecourse. A special and unique guided tour had been provided by HKJC to introduce to us the history of horse racing in Hong Kong. A full house registration showed that the visit was attractive and valuable. Our second event will be a visit to the Sha Tin Racecourse as well as the Stable Energy Center in December. We are looking forward to see you soon.